Breast cancer is the most prevalent form of cancer among American women, and has the second highest mortality rate in females after lung cancer. The MDA-MB-231 epithelial triple negative breast cancer (TNBC) cell line is isolated from a 51-year-old Caucasian female with a metastatic mammary adenocarcinoma and is very widely-used in cancer research laboratories. The MDA-MB-231 cell line is ER-negative with an invasive phenotype an appearance of spindle-shaped cells. According to the study published in Breast Disease Journal, the TNBC cell lines are extremely aggressive and mirror the original tumors, making them powerful tools for investigative breast cancer research using MDA-MB-231 xenograft model. The MDA-MB-231 cell line is used to create the CDX (Cell Line Derived Xenograft) MDA-MB-231 xenograft mouse model. 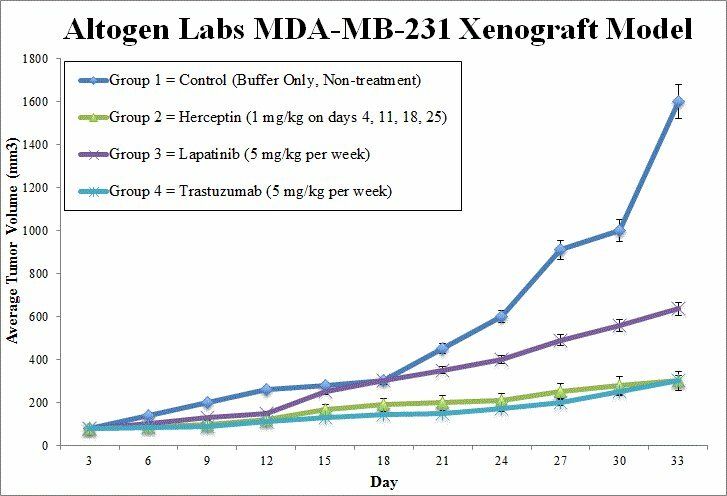 The MDA-MB-231 xenograft model is HER2 negative, CK18 and EGFR positive and exhibits tumor growth inhibition from herceptin, lapatinib and trastuzumab. Research that has used these cells include the study by Iorns et al. (2012) that examined the MDA-MB-231 xenograft mouse model to determine the expression changes that occur when breast cancer cells metastasize to from the mammary pad primary tumor to distant organs. They found that the tumor cells had several changes in gene expression that suggests its necessity for successful metastasis and secondary organ tumor growth. A 2008 study by Radestock et al. selected the MDA-MB-231 xenograft model to study the effects of relaxin on tumor cells in an oestrogen receptor alpha-negative system. Relaxin overexpression was previously associated with promotion of migration however this study identified a novel mechanism of action where long-term relaxin expression leads inhibition of growth and invasion of breast cancer cells through the down-regulation of S100A4 (metastasin), a promotor of metastasis linked to poor prognosis in cancer patients. Finally, a 2016 Nature study (Wang et al.) used the MDA-MB-231 xenograft model to investigate the mechanism of action of SL4, a compound known to slow tumor invasion and angiogenesis. They report that SL4 inhibits proliferation through cell cycle arrest with clinically relevant IC50 values and apparent toxicity. Cells are continually grown under aseptic conditions prior to collection and in an exponential phase. Post- collection, cells viability is determined. A 98% minimum viability via trypan blue exclusion assay is required. All cell suspension concentrations are adjusted by volume such that a 100 µL injection of the Matrigel + MDA-MB-231 cell suspension contains one million cells. The cell suspension is inoculated s.c. into a flank of one hind leg per. NOD/SCID or athymic BALB/C are used and are 10-12 weeks old. Calipering of tumors determines start of the study, with an expectation of 50-150 mm3 Sorting of animals into cohorts and administration of test compounds are performed according to the established treatment schedule. Daily tumor measurements are recorded. The tumor size limit in the study plan determines the completion of the study. Necropsies are performed for tumor removal, weights are recorded and then documented digitally. Tumors and tissues can be snap frozen in Liquid Nitrogen, stabilized in RNAlater or nucleic acids isolated.